"I Am That" on Video! Be in the presence of Maharaj for 90 minutes while the camera remains on his expressions, observe his gestures, listen to his voice while looking in his eyes. In this DVD Maharaj is covering most of the core essence of his teachings. An AMAZING document... You are in Maharaj presence! This film was given to us by S.K. Mullarpattan, the translator you will see in the film, who was Maharaj’s primary translator from 1976 to 1981. Contained in this video are one and a half hours of questions and responses taking place between Maharaj and some of his devotees. The footage was taken from an old, low quality, VHS tape. The camera stays on Nisargadatta even when questions are asked providing us with a chance to observe his expressions for most of the time. We have not been able to identify the people who have created this amazing document, but we are grateful and extremely thankful for their effort. To accurately translate this important historical document, we used three different translations, the main one from Mohan Gaitonde, (Maharaj’s part time evening translator). 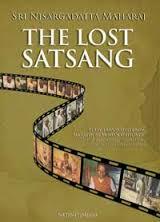 The “Lost Satsang” is now fully subtitled in English while the original video material has not been edited. * The original unedited 91 minutes fully translated and subtitled from Marathi. Watch THE LOST SATSANG streamed online.